I’ve always been fascinated by the concept of love locks. I used to see them fairly regularly on my strolls across the Sydney Harbour Bridge. Lovers young and old would write or engrave their names onto a padlock and fasten them to the metal criss-cross fence lining the eastern pedestrian walkway. The key would then be thrown into the harbour below, symbolically rendering their love unbroken for all of eternity. On occasion I would count upwards of 100 love locks, and I took much inspiration from stopping to read the names & messages that appeared on their metallic surfaces. I’ll always remember one in particular that simply read “Ugné + Darren” – it was late in the evening as it attracted my attention, catching a reflection from the passing traffic. I smiled and silently wished this unknown travelling couple a lifetime of happiness, knowing they’d experienced their very own moment of romance standing at this exact same spot with the majestic sails of the Opera House peaking perfectly in the background. Eight months after leaving Sydney, I found myself in Seoul visiting the N Seoul Tower. Being the tallest structure in South Korea at 236 metres, its overall height is further boosted to nearly 480 metres above sea level due to the fact that it sits on top of Namsan Mountain; the observatory at the top offering spectacular 360° views across the sprawling metropolis. But it wasn’t the view nor the tower itself that I found most fascinating about my visit to said attraction – it was its famous collection love locks that roused my senses the most. It was a busy Monday morning in the centre of the city, and I’d spent around half an hour walking through Namdaemun Market before approaching Namsan Park on foot from the northeast corner. The uphill trek toward the tower was stunning – it was almost unbelievable just how peaceful and pristine the forests of the park were, considering its proximity to one of the largest cities in the world. Eventually the forest cleared and the N Seoul Tower stood out majestically above the canopy. I always try to reach the highest point of each city I travel through, and I couldn’t wait to see the urban sprawl of Seoul from the observation deck above. 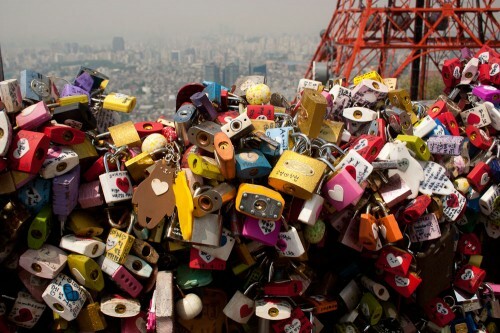 It wasn’t until I arrived at the base of the tower that I began to understand the true extent of the love locks. I mean, I’d read about them in my guidebook but it simply described the sight as being ‘trees’ covered with padlocks which symbolise eternal love. I knew to expect a few of these trees, but much to my surprise I was greeted with an entire kaleidoscopic fence full of padlocks, key rings, phone cases, tags, hearts and toys – there was such an array of dazzling paraphernalia attached to the railings! It was back in May 2012 that I first came across the concept of the pet cafe. I was travelling through Tokyo at the time, and I’d heard about a craze sweeping through the city where cat-loving entrepreneurs were opening tearooms full of kittens, allowing their clientele to play with them, watch them, relax around them and ultimately fulfil their desires for feline affection while sipping on a matcha latte. I visited one such venue with my friend Shino, a delightful cafe in Shibuya called Hapineko (it translates to ‘happy cat’ – how kawaii!). You can read my TripAdvisor review on it here, but altogether it was a very pleasant way to spend an hour, chilling out in a room with 15 or so cats at our disposal. I didn’t think too much more into pet cafes after that, until only a few months ago while I was busy researching unique attractions in Seoul. I had a 3-day stopover in South Korea last month on my way from Australia back to Canada and I felt like venturing a little further away from the typical touristy things that my guidebook recommended me to see. 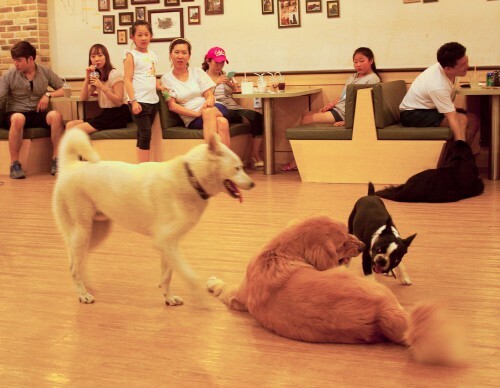 Thanks to the kind folk of Reddit, I quickly came to realise there was an area in Seoul which was abundant in pet cafes – there were not only cat cafes, but dogs and even sheep were covered! So I booked myself a room in the university district of Hongdae and happily explored the many wondrous pet cafes of Seoul during my time there.